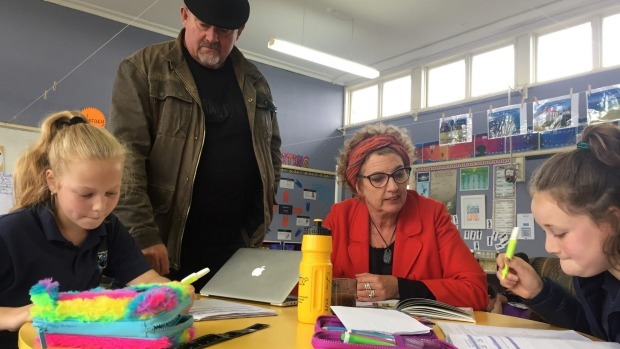 Teacher aides at Waverley Park School in Invercargill are among those struggling with Government funding. Waverley Park teacher aide Fiona Walker said being a teacher aide meant she had to work a second job and pay more tax to get by, especially during the school holidays when teacher aides are not paid. But the biggest problem was that teacher aides were “swamped” at the school, she said. More Government funding would help bring in more teacher aides so they were not so stretched, she said. In March, the NZEI Te Riu Roa union said funding for schools’ operational grants, which was used to pay non-teacher staff, was frozen this year. However, Education Minister Hekia Parata said there was no freeze of schools’ funding. To show the government how difficult the job was NZEI asked MPs to “step into the shoes” of teacher aides on first day of school term. On Monday, Labour Invercargill Labour candidate Liz Craig went to Waverley Park School and Clutha-Southland National MP Todd Barclay visited Oxford Kindergarten and Longford Intermediate School last month. Invercargill MP Sarah Dowie has yet to accept a take part in the “step into the shoes” invite. Waverley Park School principal Kerry Hawkins said the school had about 10 teacher aides, most worked individually with a student, but only about four were on general duties. Ideally having one in each of the schools 12 classrooms, and six on general duties would be helpful, he said. The school was similar to the national average of about 20 per cent children who needed specialised help, but only 1.5 per cent of children were funded for it, which meant money for more teacher aides came from the school’s pocket, he said. The money, having to come from elsewhere, meant cuts were made to other resources or staff. Waverley Park school was not unique, like many other schools there were children with physical, health, communication, behavioural, speech and language issues, Hawkins said. Every classroom had at least one student with those needs, he said. Teacher aides had to manage students with the most difficulties but were often the most underpaid. Liz Craig, who sat in a classroom helping teacher aides, said the experience emphasised a need for better funding in the sector. Labour was “really concerned” children who needed specialised help would miss out, she said. Clutha-Southland National MP Todd Barclay said it was his goal to visit every school in Cluth-Southland, meeting with principals, teaching and support staff, parents and students, but shadowing their teacher aides gave him “a real understanding of the challenges and rewards associated with the role”. This year the government invested more than $11b in education. “We have increased operational grant funding for schools by more 16 per cent since coming to government which allows schools to spend more money on the areas they prioritise for their students like teacher aides, Barclay said. From last year’s Budget an extra 1250 students benefited from extra teacher aides because of an additional $15.3 million of funding for in-class support. Invercargill National MP Sarah Dowie was yet to take part in the campaign. But she had made regular visits to Invercargill schools, rural and city, low and high deciles, she said. Previous Post:The Bachelor Recap: Who will Zac choose?